Chinatown Art Brigade (CAB) is a cultural collective of artists, media makers and activists creating art and media to advance social justice. Their work is driven by the fundamental belief that collaboration with and accountability to those communities that are directly impacted by racial, social and economic inequities must be central to our cultural, art, or media making process. Currently, Chinatown Art Brigade is a project-driven collective that is working in close collaboration with CAAAV Organizing Asian Communities’ Chinatown Tenants Union, a grassroots organization that works with (and organizes low-income) pan-Asian communities around tenant rights, fighting evictions and community empowerment. As a new collective of Asian American social justice artists, cultural workers and media makers; our work is driven by the fundamental belief that collaboration with and accountability to those communities that are directly impacted by racial, social and economic inequities must be central to any cultural, art or media making process. 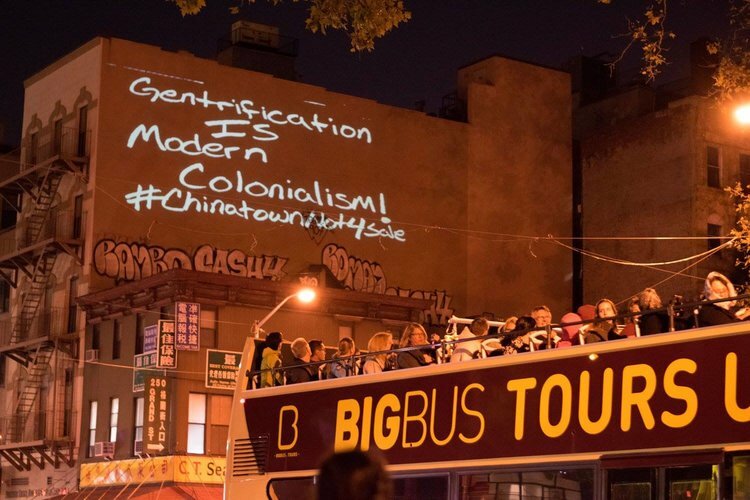 HERE TO STAY – a project that includes a series of large-scale outdoor mobile projections that will address themes of gentrification, displacement and community resilience in NYC’s Chinatown. Artwork based on oral histories, photography and video created in community-led workshops will be incorporated into photo and video montages that will be projected onto buildings and public landmarks in Chinatown and the Lower East Side. If are interested in volunteering and getting involved with the Chinatown Art Brigade, email chinatownartbrigade@gmail.com.